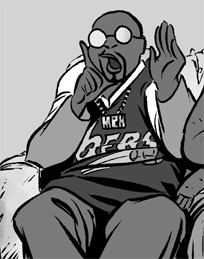 MPH is the resident hothead and a badass from North Philadelphia. Slow to trust, Malcolm joined Lambda Sigma Rho because the brothers were the only guys on campus not to treat him like a token black guy. For some reason, authority usually goes to Malcolm’s head and he’s found of torturing pledges, especially the current ones, Norm and Jack. MPH was lost in Ancient Egypt with the pledges and Brother Biff and temporarily altered the course of history. He got an internship at the White House with the Obama Administration. After attempting to use his position to get his cousin out of Iraq and Afghanistan, he took a bunch of the bros there himself and saved his cousin and another Lambda Sigma Brother, Sloppy Dave. MPH was fighting with Ira at the time, but they became friends again. Unfortunately, he discovered that Pledge Jack slept with his girlfriend, Michelle, while he was away. Surprisingly, he has held no ill will against Jack. It is unknown if he will continue his contentious relationship with Michelle.